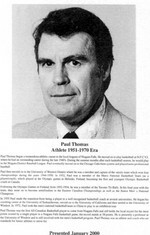 Paul Thomas began a tremendous athletic career in the local leagues of Niagara Falls. He moved on to play basketball at N.F.C. V.I. where he had an out-standing career during the late 1940's. During the summer months after each basketball season, he would play in the Niagara District Baseball League. Paul eventually moved on to the Chicago Cubs farm system and played semi-professional baseball. Paul then moved on to the University of Western Ontario where he was a member and captain of the varsity team which won four championships during the years 1946 -1950. 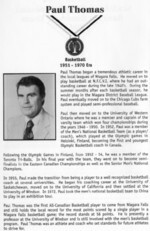 In 1952, Paul was a member of the Men's National Basketball Team (as a player/ coach), which played at the Olympic games in Helsinki, Finland, becoming the first and youngest Olympic Basketball coach in Canada. Following the Olympic Games in Finland, from 1952 -54, he was a member of the Toronto Tri-Balls. In his final year with the team, they went on to become semi- finalists in the Eastern Canadian Championships as well as the Senior Men's National Champions. In 1955, Paul made the transition from being a player to a well recognized basketball coach at several universities. He began his coaching career at the University of Saskatchewan, moved on to the University of California and then settled at the University of Windsor. In 1972, Paul took the men's national basketball team to China to play in an exhibition tour. Paul Thomas was the first All-Canadian Basketball player to come from Niagara Falls and still holds the local record for the most points scored by a single player in a Niagara Falls basketball game; the record stands at 59 points. He is presently a professor at the University of Windsor and is still involved with the men's basketball program. Paul Thomas was an athlete and coach who set standards for future athletes to strive for.